Improve fine motor skills and develop creative thinking skills with this Junior GeoStix®construction set. 10 different lengths including quarter and half-circle pieces that snap together at different points. 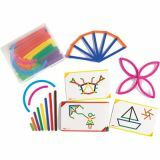 The set includes 200 flexible plastic sticks, and 30 double-sided activity cards. Sizes range from 2.5cm to 15cm and 90° R7.07cm and 180° R7.07cm pieces. Inspire imagination and creativity while developing fine motor, creative thinking and problem solving skills. 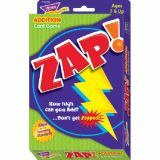 An ideal hands-on manipulative for children from 3 to 99! Contents: ​200 flexible GeoStix® in 10 sizes including quarter and half-circle pieces, 30 double-sided activity cards, instruction manual. Counting, comparing, and knowing number names all become more fun with these cute sports hats, which sit nicely on top of standard Unifix cubes. Students use them to label stacks of cubes with the correct number and to play simple number games. Includes 3 sets of hats labeled 1–10 (30 pieces) and sample activities. Over There! Math Cards get your students moving as they solve standards-based problems. Unlike "I Have, Who Has?" cards, you'll get the whole class involved and out of their seats and solving problems. This box contains 84 color-coded activity cards (8 ½” x 11”) and teaching guide including instructions, correlations, and reproducible sheets for assessing student progress. 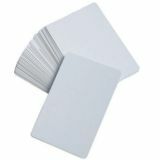 Create your own game or activity with this set of 50 high quality cards coated on both sides. Use for Bulletin boards, math aids, lesson displays, story Starters and more. Printed both sides on heavy coated stock. Great for teaching about money and making change, or for use as classroom decorations. 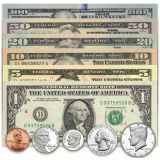 Set includes one $100 bill, two $50 bills, five $20 bills, four each of $10 and $5 bills, and five $1 bills. Also includes two 50-cent pieces, four quarters, and six each of dimes, nickels and pennies. Each set includes a total of 45 pieces. 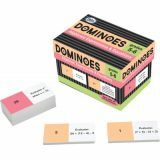 Our foam dominoes give students a fun way to practice and reinforce key math concepts. Game includes two sets of 24 color-coded dominoes (48 total pieces); each set is ideal for up to four players. Instructions included. Made of durable foam (3” x 1 ½”). 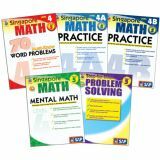 The problems in this set focus on the 5th and 6th grade level standards for algebraic expressions and equations. Ideal for any students needing additional practice. 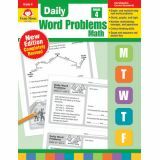 Completely revised in 2019 to reflect grade-level standards, Daily Word Problems is the perfect resource to improve students' problem-solving skills. The all-NEW word problems are written to support current math standards and expectations and provide consistent spiral review of math concepts. Students' problem-solving skills improve as they participate in meaningful, real-life math practice. 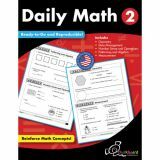 The 36 weeks of activities provide practice of grade-level math concepts such as addition, multiplication, fractions, logic, algebra, and more. Each week focuses on a theme and provides a daily word problem within the context of a real-life situation. Monday–Thursday's activities provide a one- or two-step word problem. Friday's format is more extensive and requires multiple steps. The multi-step problems require students to incorporate higher-order thinking skills by applying their understanding within a different context. Reproducible pages provide plenty of room for students to solve using the strategy of their choice. What's new in the revised edition of Daily Word Problems? Includes scope and sequence chart and an answer key. 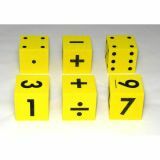 Soft 2" foam dice are a quiet classroom tool, easy to see, pick up, and read. 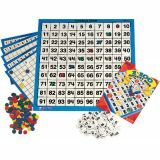 Great for games and math activities. Washable, too!